Constructed from 2.5mm of super soft X-Foam neoprene this kids wetsuit delivers warm water comfort and protection from scrapes and bumps. Constructed from 2.5mm of super soft X-Foam neoprene this kids wetsuit delivers warm water comfort and protection from scrapes and bumps. Super-stretchy neoprene side panels improve range of motion while super comfortable Glideskin features around ankles, wrists and neck. This material seals the suit reducing sea water intrusion to maintain a more regular temperature within the suit. Thinner neoprene has been used on the wrists so that they can rolled up or down to get the right arm length or when it gets too warm. Scubapro is dedicated to caring for the environment. Their petroleum free X-Foam neoprene not only helps to reduce global fossil fuel use but is lighter and warmer than traditional neoprene. Complete Freedom Of Movement - Stretchy and flexible X-Foam neoprene provides protection without hindering movement when diving. The side panels are extra stretchy to further aid in range of motion. Rollable Sleeves - Constructed from thinner neoprene the sleeves can be rolled up or down. Get the right fit, or roll them up when it’s too warm. Knee Protection - Padding at the knees provides extra protection when you’re resting. Grippy BCD Surface - The shoulders of the Rebel feature a tacky surface. When wet, it stops your BCD from slipping off your shoulders. Flatlock Stitching - Flatlock stitching ensures abrasion-free comfort on your skin. Durable YKK Zippers - Corrosion resistant YKK zippers will last for years to come, more than ready to take on the abuse kids can throw at them. Environmentally Friendly - Scubapro is committed to protecting the world’s seas. The Scubapro Rebel 2.5mm uses X-Foam. A petroleum-free Neoprene which helps to reduce global petroleum consumption and conserve the world’s seas. Solvent-Free Glue - Scubapro use solvent-free glue in their neoprene products to ensure they’re helping to protect the world’s seas. Who is the Scubapro Rebel Kids Wetsuit 2.5mm for? 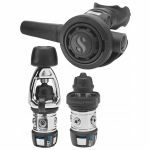 Suitable for both boys and girls the Scubapro Rebel 2.5mm is perfect for warm water snorkelling. Highly flexible and hard wearing, it’ll handle all your kid’s adventures.